Today we check out two pinot noirs each costing around $14 at Costco. 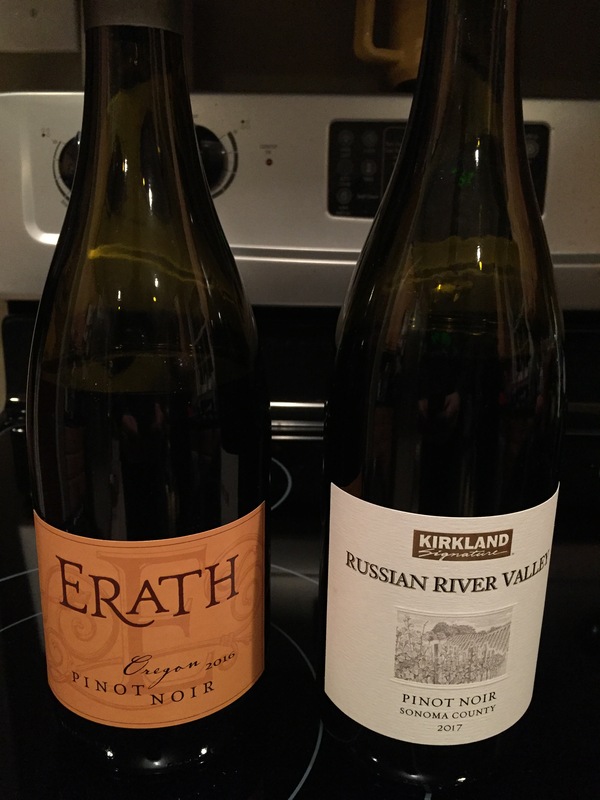 Erath (also can be found for $14 at Total Wine) is a 2016 Oregon pinot noir. To be honest, I’ve disliked this wine in the past. But this Erath is a new and different animal. For one thing, it’s cheaper. That goes shockingly against the trend, as all Oregon pinot noir prices have been rising steadily since the 1990’s. So if it was disappointing in the 2000’s, you would think the new, cheaper Erath would be just awful. But actually, this wine is delicious. It’s just — simpler. It is tart, juicy, light, and a little bit spicy, with a hint of cranberries and roses. Yum. Kirkland Russian River Valley pinot noir is a 2017 California wine that looks expensive and comes off very friendly at first. It’s a little bit tart, but after a couple of sips there is a sweetness that begins creeping in around the cherry flavor. And not a good sort of sweet — it’s what you might get from an artificial / chemical sweetener that’s trying to imitate vanilla and cinnamon. There is also a little bit of “oak” in this wine, which I put in quotes because it doesn’t really fit in. It’s like the maker was thinking, “well, we’re in California, better add some oak to this.” Which doesn’t necessarily make sense for a pinot noir. Yes, the Russian River Valley is supposed to be “so great” but this shootout was no contest. Once we went back to the Erath, the chemical sweetness was gone and it was just fresh, simple pinot noir. The winner: Erath 2016 Oregon pinot noir.